Bei chronisch entzündlichen Darmerkrankungen findet man in der Lavage des Darmes erhebliche Mengen an Leukotrien. Mehrere Studien und Hunderte von Einzelbeobachtungen konnten inzwischen eine Verbesserung (keine Heilung) der Situation bei einschlägigen Patienten erzielen. Supplementation with a lecithin-based delivery form of Boswellia serrata extract (Casperome®) controls symptoms of mild irritable bowel syndrome. OBJECTIVE: Irritable Bowel Syndrome (IBS) is a chronic, gastrointestinal disorder in which abdominal pain or discomfort is associated with defecation or changes in bowel habits. Its multifactorial pathophysiology leads to a variety of available treatments, mainly aimed at controlling symptoms. The management of IBS patients could be optimized by individualized strategies, including non-pharmaceutical approaches. In this study, we evaluated the efficacy and safety of a novel delivery form of Boswellia serrata extracts (BSE) (Casperome®) in patients with IBS. PATIENTS AND METHODS: 71 otherwise healthy subjects with idiopathic IBS were recruited. Participants were assigned to the following management strategies: hyoscine butylbromide; papaverine hydrochloride + A. belladonna extract; supplementation with Casperome®. Predominant IBS symptoms were evaluated at inclusion and at the end of the observational period (4 weeks). The numbers of subjects who needed rescue medication or medical attention/hospital admission were recorded. Adverse events were also evaluated. RESULTS: In all groups, the IBS symptoms investigated, namely abdominal pain, altered bowel movements, meteorism and cramps improved during the observational period. Of note, the number of subjects who needed medical attention significantly decreased only in Casperome®-supplemented group. In addition, Casperome® supplementation was related to a lower incidence of side effects (mainly stypsis). CONCLUSIONS: This preliminary study suggests that Casperome® supplementation could represent a promising alternative approach to manage symptoms associated with IBS in otherwise healthy subjects. Eur Rev Med Pharmacol Sci. 2017 05;21(9):2249-2254. 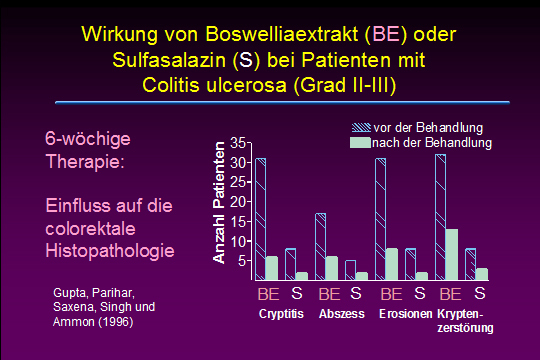 Managing ulcerative colitis in remission phase: usefulness of Casperome®, an innovative lecithin-based delivery system of Boswellia serrata extract. OBJECTIVE: Boswellia serrata extracts (BSE) have been traditionally used for the treatment of several inflammatory diseases. The aim of this study was to evaluate the efficacy of a novel delivery form of BSE (Casperome®) in Ulcerative Colitis (UC) during minimally symptomatic remission phase. PATIENTS AND METHODS: In this open-label, observational, registry study, informed participants with UC in remission phase (n = 43) freely decided to receive the oral daily Casperome® supplementation (n = 22) or no supplementation (n = 21) for 4 weeks. Several parameters associated with minimally symptomatic UC in remission were evaluated at the inclusion and the end of the study. RESULTS: A significant beneficial effect of Casperome® was observed for all the parameters evaluated, namely: diffuse intestinal pain, evident and occult blood in stools, bowel movements and cramps, watery stools, malaise, anemia, rectal involvement, number of white blood cells as well as need for concomitant drugs and medical attention. Faecal concentration of calprotectin, a marker of bowel inflammation, resulted ameliorated in Casperome® supplemented patients. CONCLUSIONS: Our study showed that Casperome® supplementation attenuates symptoms associated with mild UC in remission, reducing the use of drugs and medical consultations. Therefore, our study suggests that Casperome® supplementation could represent a promising alternative approach to manage minimally symptomatic UC and maintain the remission phase. Eur Rev Med Pharmacol Sci. 2016 06;20(12):2695-700. Nutraceutical Supplements for Inflammatory Bowel Disease. Nutr Clin Pract. 2015 Aug;30(4):551-8. Randomized, placebo-controlled, double-blind trial of Boswellia serrata in maintaining remission of Crohn's disease: good safety profile but lack of efficacy. BACKGROUND: Complementary therapies are frequently used by patients with inflammatory bowel disease (IBD). The aim of this study was to evaluate the efficacy and safety of long-term therapy with a new Boswellia serrata extract (Boswelan, PS0201Bo) in maintaining remission in patients with Crohn's disease (CD). METHODS: In 22 German centers a double-blind, placebo-controlled, randomized, parallel study was performed. In all, 108 outpatients with CD in clinical remission were included. Patients were randomized to Boswelan (3×2 capsules/day; 400 mg each) or placebo for 52 weeks. The primary endpoint was the proportion of patients in whom remission was maintained throughout the 52 weeks. Secondary endpoints were time to relapse, changes of Crohn's Disease Activity Index (CDAI), and IBD Questionnaire (IBDQ) scores. RESULTS: The trial was prematurely terminated due to insufficient discrimination of drug and placebo with regard to the primary efficacy endpoint. A total of 82 patients were randomized to Boswelan (n=42) or placebo (n=40). Sixty-six patients could be analyzed for efficacy. 59.9% of the actively treated patients and 55.3% of the placebo group stayed in remission (P=0.85). The mean time to diagnosis of relapse was 171 days for the active group and 185 days for the placebo group (P=0.69). With respect to CDAI, IBDQ, and laboratory measurements of inflammation, no advantages in favor of active treatment were detected. Regarding safety concerns, no disadvantages of taking the drug compared to placebo were observed. 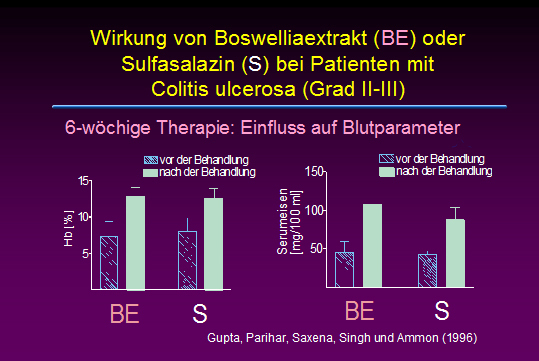 CONCLUSIONS: The trial confirmed good tolerability of a new Boswellia serrata extract, Boswelan, in long-term treatment of CD. However, superiority versus placebo in maintenance therapy of remission could not be demonstrated. Inflamm Bowel Dis. 2011 Feb;17(2):573-82. BACKGROUND: Most moderate-severe juvenile Crohn's disease (CD) patients are in a constant catabolic state resulting in poor weight gain and growth failure. Anti-inflammatory, immunomodulatory, and monoclonal antibody drugs, as well as growth hormone (GH), frequently fail to achieve sustained remission or reverse growth failure. OBJECTIVE: To test whether an exclusion diet with nutraceutical therapy (DNT) could induce sustained clinical remission and weight gain, and if so does this enhance the ability for GH to reverse growth failure. METHODS: An uncontrolled prospective case study was undertaken in six moderate- severe CD patients, two of whom had completed growth. All were treated with DNT. Adequate caloric and protein ( >or= 3g/kg/d) intake for catch up weight was prescribed. Dairy products, certain grains and carrageenan containing foods were eliminated. Nutraceuticals, consisting of fish peptides, bovine colostrum, boswellia serrata, curcumin and a multivitamin were administered daily. Lactobacillus GG, a probiotic, was administered twice weekly. Recombinant human GH (rhGH) was administered daily. CONCLUSION: DNT engendered prolonged remission and restoration of normal weight in moderate-severe juvenile CD patients, providing conditions that enabled rhGH to stimulate growth. These findings justify larger controlled trials to evaluate the long-term benefit of compliance to DNT in both juvenile and adult CD patients. 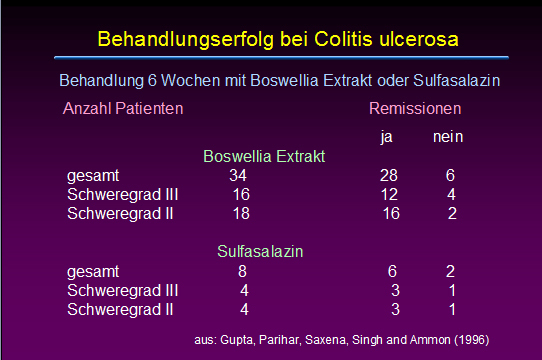 Boswellia serrata extract for the treatment of collagenous colitis. A double-blind, randomized, placebo-controlled, multicenter trial. BACKGROUND AND AIMS: The objective of this study was to investigate the effect of Boswellia serrata extract (BSE) on symptoms, quality of life, and histology in patients with collagenous colitis. RESULTS: Thirty-one patients were randomized; 26 patients were available for per-protocol-analysis. After 6 weeks, the proportion of patients in clinical remission was higher in the BSE group than in the placebo group (per protocol 63.6%; 95%CI, 30.8-89.1 vs 26.7%, 95%CI, 7.7-55.1; p=0.04; intention-to-treat 43.8% vs 26.7%, p=0.25). Compared to placebo, BSE treatment had no effect on histology and quality of life. Five patients discontinued BSE treatment prematurely. Discontinuation was due to adverse events (n=1), unwillingness to continue (n=3), or loss to follow-up for unknown reasons (n=1). Seven patients received open-label BSE therapy, five of whom achieved complete remission. CONCLUSIONS: Our study suggests that BSE might be clinically effective in patients with collagenous colitis. Larger trials are clearly necessary to establish the clinical efficacy of BSE. Int J Colorectal Dis. 2007 Dec;22(12):1445-51. Use of complementary and alternative medicine in Germany - a survey of patients with inflammatory bowel disease. BACKGROUND: Previous studies have suggested an increasing use of complementary and alternative medicine (CAM) in patients with inflammatory bowel disease (IBD). The aim of our study was to evaluate the use of CAM in German patients with IBD. METHODS: A questionnaire was offered to IBD patients participating in patient workshops which were organized by a self-help association, the German Crohn's and Colitis Association. The self-administered questionnaire included demographic and disease-related data as well as items analysing the extent of CAM use and satisfaction with CAM treatment. Seven commonly used CAM methods were predetermined on the questionnaire. RESULTS: 413 questionnaires were completed and included in the analysis (n = 153 male, n = 260 female; n = 246 Crohn's disease, n = 164 ulcerative colitis). 52 % of the patients reported CAM use in the present or past. In detail, homeopathy (55%), probiotics (43%), classical naturopathy (38%), Boswellia serrata extracts (36%) and acupuncture/Traditional Chinese Medicine (TCM) (33%) were the most frequently used CAM methods. Patients using probiotics, acupuncture and Boswellia serrata extracts (incense) reported more positive therapeutic effects than others. Within the statistical analysis no significant predictors for CAM use were found. 77% of the patients felt insufficiently informed about CAM. CONCLUSION: The use of CAM in IBD patients is very common in Germany, although a large proportion of patients felt that information about CAM is not sufficient. However, to provide an evidence-based approach more research in this field is desperately needed. Therefore, physicians should increasingly inform IBD patients about benefits and limitations of CAM treatment. BMC Complement Altern Med. 2006 May;6():19. [Therapy of active Crohn disease with Boswellia serrata extract H 15]. BACKGROUND: The purpose of this clinical trial was to compare efficacy and safety of the Boswellia serrata extract H15 with mesalazine for the treatment of active Crohn's disease. PATIENTS AND METHODS: Randomised, double-blind, verum-controlled, parallel group comparison for which 102 Patients were randomised. The per protocol population included 44 patients treated with H15 and 39 patients treated with mesalazine. As primary outcome measure the change of the Crohn Disease Activity Index (CDAI) between the status of enrolment and end of therapy was chosen. H 15 was tested on non-inferiority compared to standard treatment with mesalazine. RESULTS: The CDAI between the status of enrolment and end of therapy after treatment with H15 was reduced by 90 and after therapy with mesalazine by 53 scores in the mean. In this non-inferiority-trial the test hypothesis was confirmed by the statistical analysis. The difference between both treatments could not be proven to be statistically significant in favor to H15 for the primary outcome measure. The secondary efficacy endpoints confirm the assessment of the comparison of H15 and mesalazine. The proven tolerability of H15 completes the results of the shown clinical efficacy. CONCLUSIONS: The study confirms that therapy with H15 is not inferior to mesalazine. 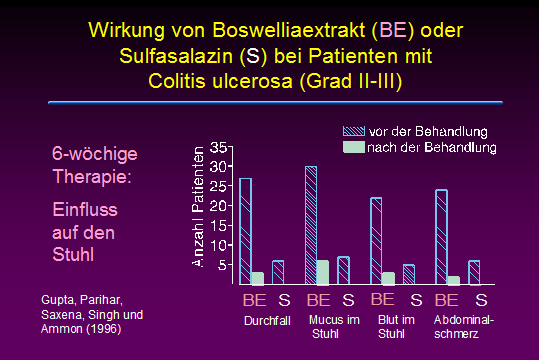 This can be interpreted as evidence for the efficacy of H15 according to the state of art in the treatment of active Crohn's disease with Boswellia serrata extract, since the efficacy of mesalazine for this indication has been approved by the health authorities. Considering both safety and efficacy of Boswellia serrata extract H15 it appears to be superior over mesalazine in terms of a benefit-risk-evaluation.